I was invited by Shangri-La Hotel Singapore for their newly launched "Time Out Weekend Staycation". We started our stay at Shangri-La Hotel with a personalised check-in counter at the Garden wing reception instead of the main lobby reception. The process was fast and I was presented a stalk of orchid which indeed make me feel very welcome by the hotel. 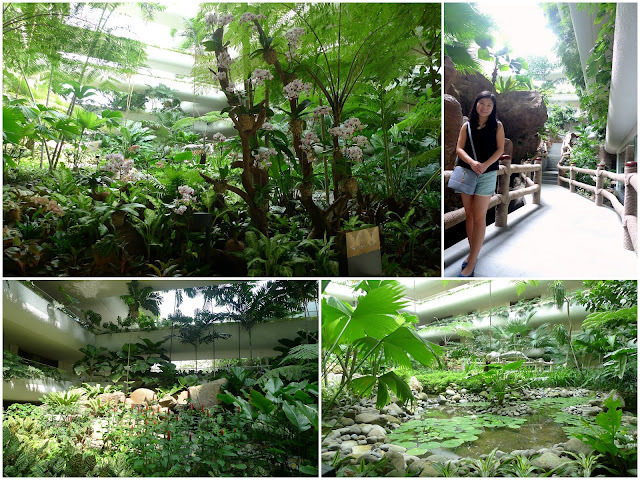 I heard my colleagues that Shangri-La Garden Wing is very different from the typical Singapore hotels and I couldn't agree more when I first saw the 15 acres tropical garden. It reminds me of a luxurious beach resort outside Singapore. 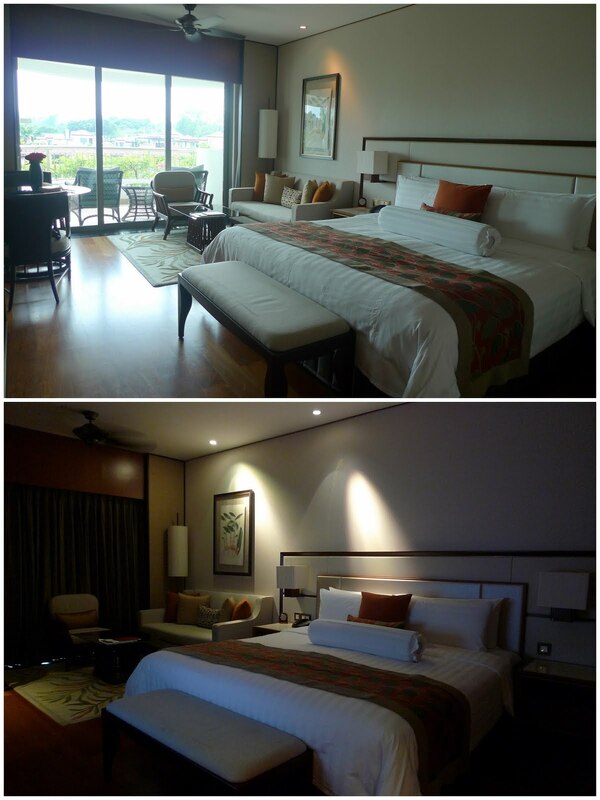 The 50sqm garden wing room is one of most spacious room among the hotels which I have stayed. The room feature a comfortable king size bed, a sofa, a work desk and a private balcony. I was impressed by the hotel eco-friendliness where the aircon will switch off automatically when the balcony sliding door is open and when the door is closed, it will switch on again. Prior to arrival, the hotel emailed me a preferences form asking for my choice of pillow, floral arrangement and beverage preference etc and all my preference was well noted by the hotel. 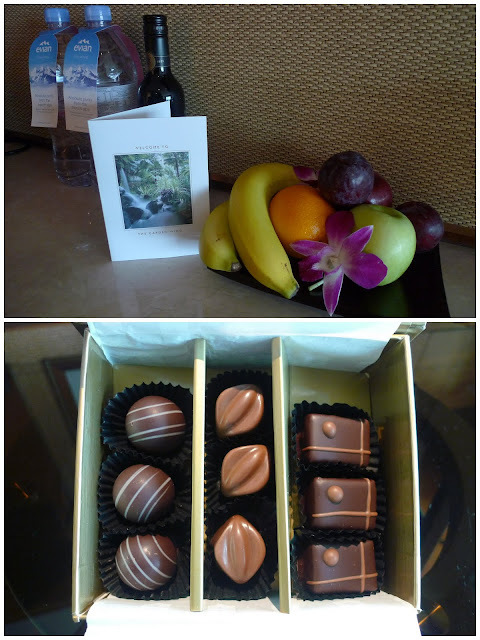 It's a nice gesture to have complimentary fruits and chocolate from the hotel. Hubby almost finished the chocolate if I had not stopped him fast enough. The marble clad bathroom comes with double sink, bathtub and separate glass-enclosed shower. I adore hotels with double sinks because Hubby and I do not have to fight over the sink when we brushed our teeth. There is an automatic wooden blind allows those guests to watch the TV while relaxing inside the bathtub. At first, we were figuring out how to open the blind and realised that the control is actually situated below the vanity mirror. The package includes Bellini Hour with a bottle of Prosecco and mixers. 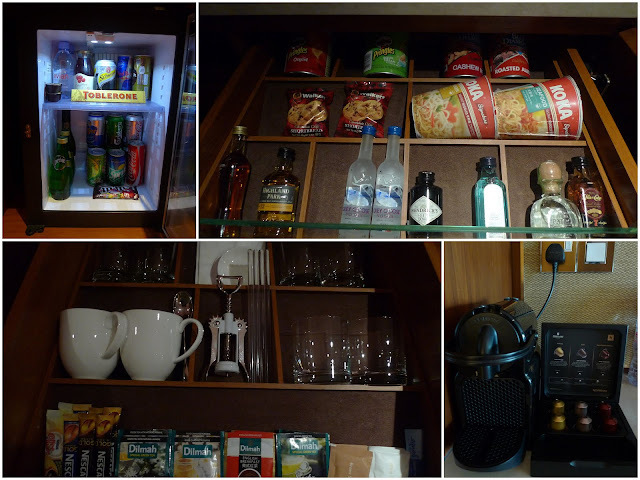 As we requested it late at night, the mixing of the cocktails were done at the bar and served straight to our room. We have a choice to have our breakfast at either the Line or the Waterfall cafe and we chose the later which has a more cozy ambience. We chose to sit at the alfresco area near the poolside. It's a treat to be surrounded by birds chipping and floral smell during breakfast. 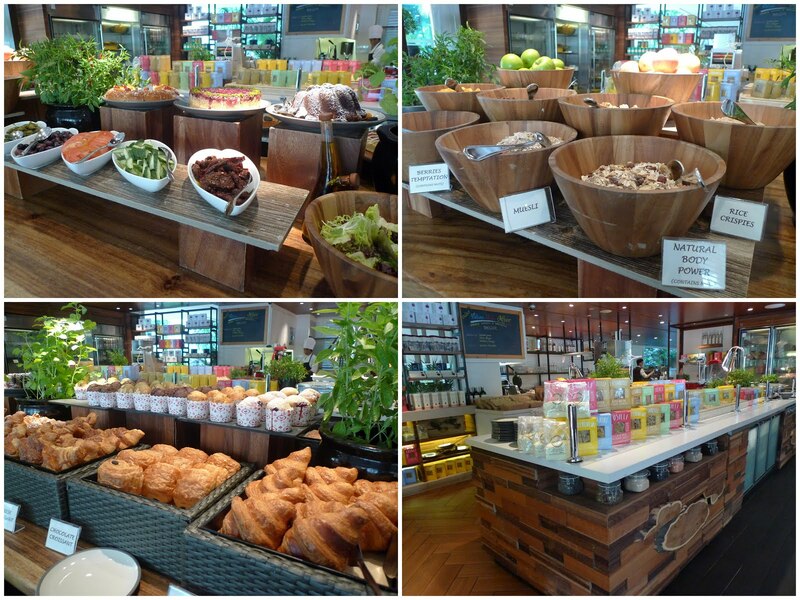 Breakfast is ala carte option at the Waterfall cafe and offer a buffet spread of pastries, cereals and fruits etc. 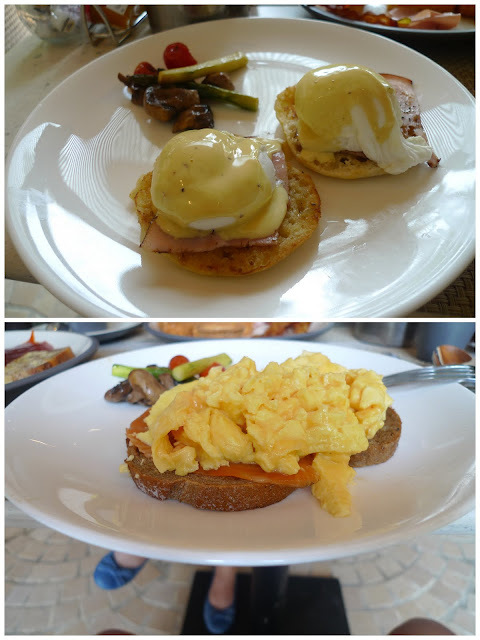 The breakfast menu has a choice of Western selection ranging from egg benedicts to pancakes and waffles or Asian selection of nasi lemak. We decided to explore the surrounding of the hotel to aid in digesting our heavy breakfast. 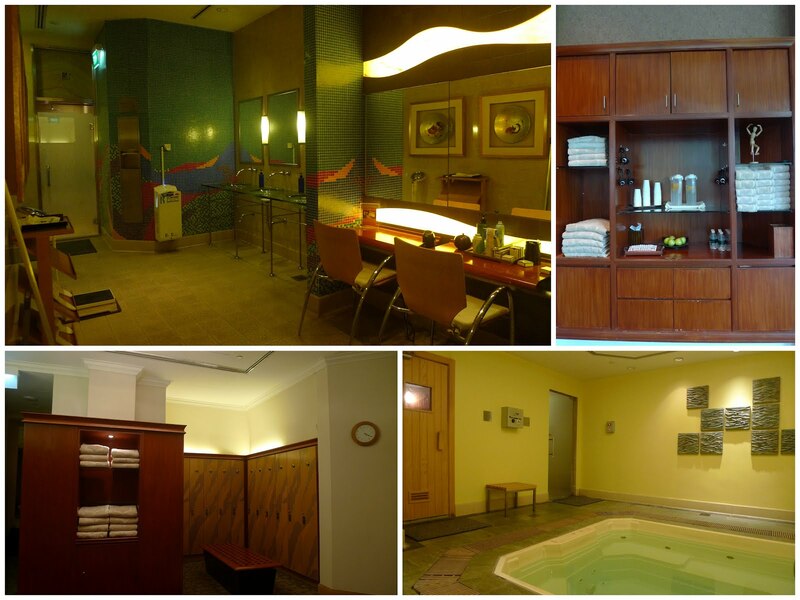 Chi Spa is Shangri-La Hotel in-house spa which offers an extensive menu of holistic treatment and is famous for their Chi Signature Massage. 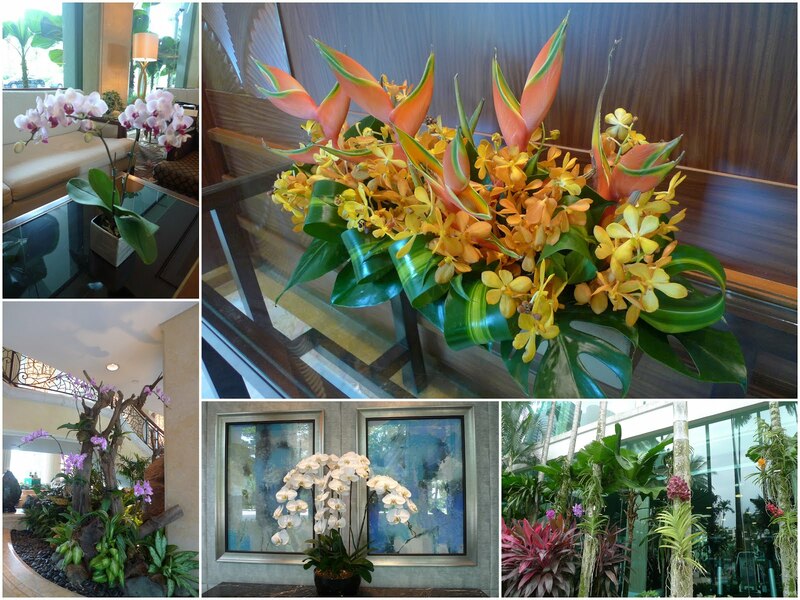 I noted that orchid is widely used by the hotel in their floral arrangement and I'm not surprised by this since orchid is Singapore's national flower. 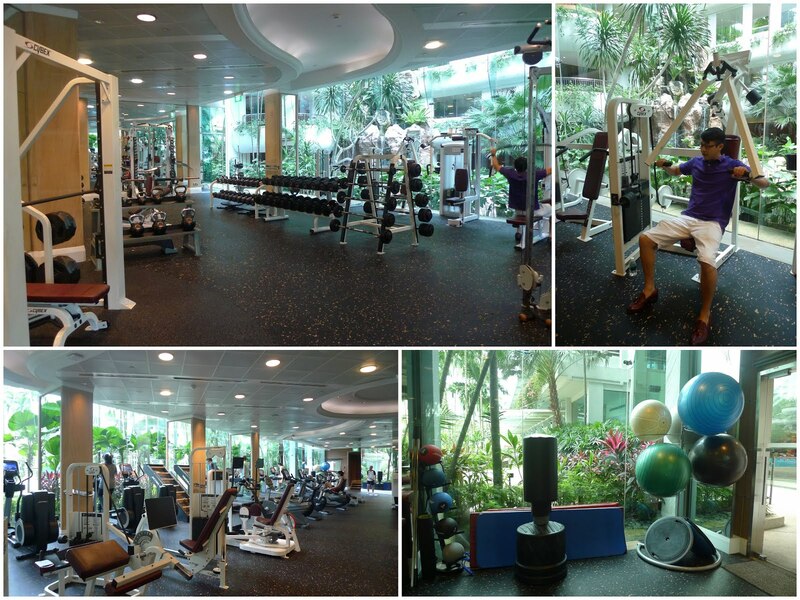 At first, we were wondering how to enter the gym and after inquiring with the person at the health club, we then get to know that the entrance is actually from the health club. There is separate entrance for gents and ladies hence I get to explore the indoor jacuzzi, sauna and steam room alone before meeting up with hubby at the gym. I was amazed by the sheer size of the gym, it's definitely the biggest hotel gym which I have seen and can rival the gyms in those fitness centres. Hubby tried out few of the equipments while I was busy snapping photos. I'm surprised to see a mini Zen garden outside Japanese restaurant Nada Man which reminds me of the days in Kyoto. We then retired back to our room. We have not catch a movie after we have shifted into our new house as weekend are occupied with doing household chores. Hence we make use of this opportunity to catch up on the movies which we have missed. 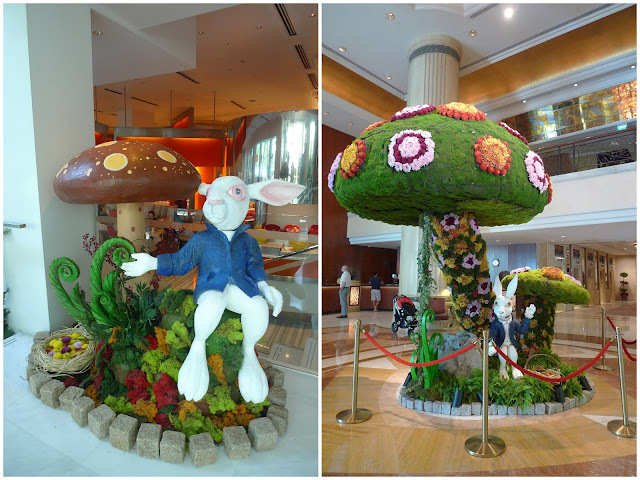 Coinciding with the Easter day next week, the Tower Wing lobby and the Line restaurant are decorated with bunnies and mushrooms figurines. We spent our quiet afternoon indulging in the elegant English Afternoon Tea at the Lobby Court. The afternoon tea set is available from 3pm and we have make prior reservation as advised by the reception when we checked in yesterday. The high tea set comes with sandwiches, cakes and pastries. We are spoilt for choice when selecting the high tea beverage as there are more than 30 types or tea and coffee to choose from. The sandwiches are delicious and we requested for another round since the items are refillable. However, I was disappointed that there was no scones in this set as scones are an integral part of English high tea. Overall, hubby and I enjoyed the lavish stay at Shangri-La hotel Singapore. The urban nature resort is a perfect getaway from the hustle and bustle of city life. 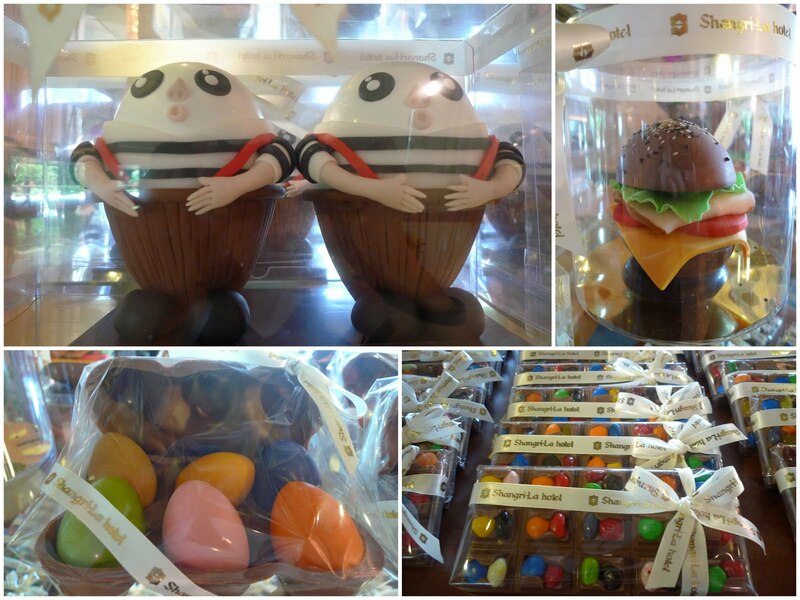 The service is impeccable and small gifts such as orchid, fruit platters and chocolate warms the guest's heart. The package is valid until 30 December 2016 and rates start from S$465. To make reservations, please click Shangri-La Hotel Singapore. Hotel stay has been sponsored by Shangri-La Hotel Singapore however all views expressed are my own.